The Four Seasons Hotel Kuwait at Burj Alshaya. Image © Hufton and Crow. With a design concept developed around a regional architectural tradition, the Four Seasons Hotel Kuwait at Burj Alshaya brings a new level of luxury to Kuwait City’s skyline for one of the world’s most renowned hospitality brands, yet it has a distinctly Kuwaiti feel. The new hotel, which recently was named the 2018 MEED Hotel of the Year and one of Wallpaper*magazine’s striking structures around the globe for 2018, not only highlights the importance of authenticity in hospitality design, but also design’s power to shape and enhance the human experience. The definition of luxury is now steadily in the hands of the consumer. Whether it’s an urban business hotel, beach retreat, or mountain hideaway, the way to exceed guests’ expectations is through a vigorous pursuit for authenticity, beauty, and novelty. For the Four Seasons Kuwait, we took an experience-oriented design approach and applied it to the high-end hospitality sector to form a holistic fabric of place. 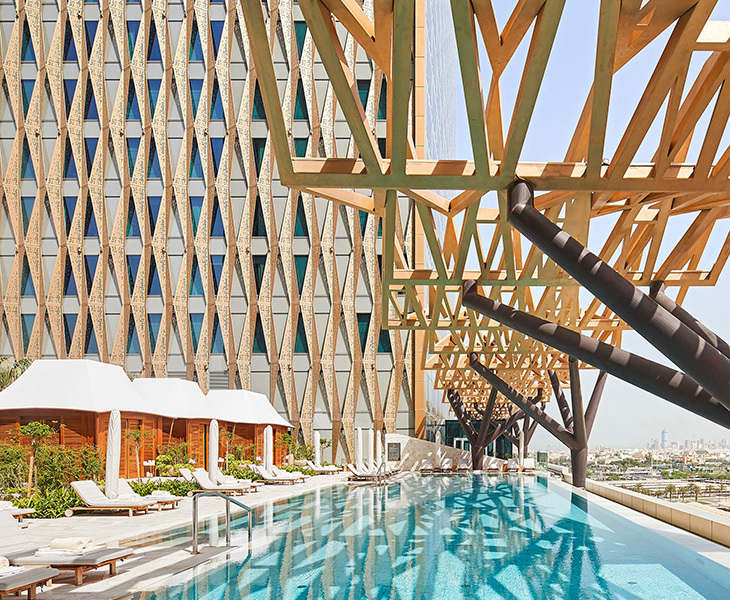 An immersive canopy along the podium pool terrace connects visually with the hotel façade. Image © Hufton and Crow. The five-star hotel includes two large ballrooms, an expansive pool-level terrace, three restaurants, and world-class spa and fitness facilities. The design is unified by an architectural design inspired by Mashrabiya latticework, a traditional urban architectural element that has been used in Arabic architecture since the Middle Ages. The result is a contextually sensitive scheme that successfully represents the Four Seasons brand, while evoking a contemporary twist on a regional architectural tradition. The architectural expression takes the concept of traditional Mashrabiya shading in local architecture and reinterprets it to create a new focal point of the city's elite social scene. Its modulating aluminium façade is both visually appealing and enhances users’ privacy during the day. Its diamond motif provides shading from a multitude of solar angles, giving off an array of colours at varying times of the day and casting poetic shadows through into the interior spaces. To achieve this, the scale of these 3-dimensional, diamond-shaped modules varies to suit the requirements of the spaces where they are located. For example, in the guestrooms, the façade is more solid and contains small perforated openings, while in the podium, the canopy has larger openings to allow for air movement. The dichroic champagne bronze shading fins unite the exterior aesthetic with its interior at night through carefully designed façade lighting. Perforated Mashrabiya shadings bring in diamond-shaped shadows into guestrooms. Image © Hufton and Crow. During the design stage, we made a conscious decision to not include a hotel sign at the tower top, as the architecture design is so unique that the building becomes immediately recognizable. The hotel is now well known in the local community and people have no difficulty in finding its location. The compact size of the hotel exemplifies the luxury experience, helping to create a clearer sense of community and space. While the front-of-house components are grand in their own scale, they are all well-connected and intimately knitted with one another, and often visually connected with the exteriors for a total immersive ‘inside-out, outside-in’ experience. Since opening, it has redefined the hospitality standard in Kuwait with acclaimed clientele and reviews. 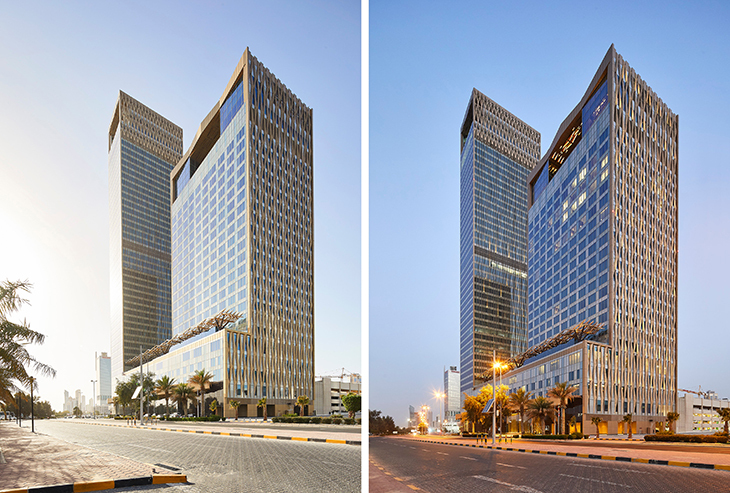 The hotel brings a signature addition from Four Seasons and Alshaya Group to the Kuwait City skyline. Image © Hufton and Crow. Together with our in-house wayfinding and graphics team, local architect and engineering partner KEO International, and Toronto-based interior designers Yabu Pushelberg, we have elaborated this concept and created a holistic, seamless experience for locals and international guests. We created a landmark that delivers the functional requirement with an interpretation of local vernacular culture in a contemporary manner—serving guests with care and pride, while echoing Alshaya’s philosophy and the Four Season’s brand. Trevor To is an award-winning architect in Gensler’s London office. He specialises in working with multi-disciplinary teams on mix-use projects, and extends his collaborative edge to various trends and topical research in the office. Contact him at trevor_to@gensler.com.